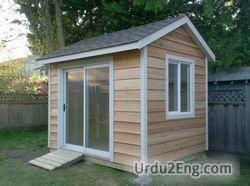 An outbuilding with a single story; used for shelter or storage. Shed at an early stage of development. Most amphibians have caducous gills. Spill the beans all over the table.